Just recently, Verizon Wireless announced one of the biggest deals of the year - it acquired 122 AWS spectrum licenses for $3.6 billion from a JV of cable providers headed by Comcast. Back then, the company mentioned the possibility of Comcast selling Verizon Wireless gear, but now Comcast Cable president Neil Smit confirmed that this is indeed going to happen in 2012. 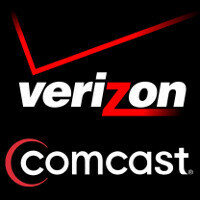 Comcast will start selling Verizon Wireless services in four market early in the year, possibly expanding that later. You can expect to see quadruple packages from cable companies which would now include phone services as well, and Verizon on its part will also sell cable products. Comcast alone is getting $2.3 billion from Big Red over the licensing deal and this will only boost the connection between the two. Time Warner Cable also plans on selling bundled packages including Verizon services and products, but the company said it was too early to say exactly what and exactly when will be sold. Of course, the deal between Verizon Wireless and cable providers still has to pass regulatory approval and this might turn out a bit tricky as it will translate into cable operators ending locked up providing products from a single wireless carrier.